In an attempt to break free from my depression and OCD, at the age of 29 I found myself sitting in an neuro-linguistic programming (NLP) practitioner training course, having a breakthrough. At the time though, it felt more like a breakdown, exclaiming to my tutor: “If I continue to remove all these masks I wear, there’ll be nothing left of me.” I remember sitting there with a deep sense of dread, finally understanding that I was a tailored version of myself to everyone around me, and I wasn’t sure who I actually was. I was born in 1982, in a small village in Leeds, to young parents who married out of convenience and divorced out of necessity when I was six years old. I was brought up by my mum – a single parent who struggled both financially and with mental health challenges, including depression and OCD. I don’t recall ever feeling like a child; I had responsibilities beyond my years and felt a natural inclination to be everything to everyone; telling those around me what I thought they wanted to hear, and being the version of myself I thought they wanted me to be. At the age of nine, my stepdad told me I needed to stop being so girly as older men would take advantage of me. At that moment, I had a realisation that I was gay and that it wasn’t a good thing to be. I began a nine-year battle with hiding the deepest part of who I was. This was one of the heaviest masks I wore. When I was 11, my younger brother and I moved in with my father in Wakefield, and I was separated from my mother and younger sister for seven years. Having been brought up by my mum in a volatile and sterile environment, the move to my dad’s seemed healthier for us both mentally and physically. However, not seeing our mother was never acknowledged by any of the adults around us, and neither my brother nor I dared to speak out. As an outsider in my teenage years, my life felt so out of my control and I remedied this by accessing my maternal bloodline’s usual coping mechanism, OCD. We term it “our family’s illness” and the stories of past generations focus on each different relative’s version of OCD. I attempted to control everything I could about the world I lived in, but without it coming to the attention of anyone else. My cabin bed became my world – completely organised, with a place for everything. I took a job at the school library, as this allowed me to eat my lunch alone in the corridor outside. I’d then enter the library and carefully tidy each book on each bookshelf until the bell would ring. The library became somewhere safe for me, and the usual torments placed on a gay child in school became the activities of the corridors and classrooms. My dad and step-mum didn’t recognise my OCD, and many of my behaviours were joked about and shrugged off. My dad tested my boundaries one day by moving everything in my cabin bed while I was at school – disorganising the drawers, the cupboards, my wardrobe. To this day I cannot recall my reaction; it’s a complete blank, and I’ve chosen not to ask anyone about how I responded. Later in my teenage years, my usual mood was one of deep sadness, but I didn’t know I was depressed. I had thoughts of not wanting to be here anymore and two things kept me going. One, I couldn’t possibly leave my younger brother; we had experienced everything together and I had to be there for him. Two, I didn’t want to attempt it and fail, and then have to live with everyone knowing I wasn’t well. At 17 years old, I moved in with my mum and we repaired our relationship. Yet all the love we had for one another wasn’t enough to stop our versions of OCD fighting. My mum has OCD for cleanliness, and I for tidiness. She had to clean my bedroom every day, which included moving and cleaning every item individually. I would return home from college and have to put every item back in place. Many evenings would end with us both frustrated and crying at the madness of it all. I moved into my own flat at the age of 19, taking my OCD to the most extreme level I experienced. I was now free to be my own person and at the same time, I was the most trapped I had ever been. On the days my depression permitted me to get out of bed, the day revolved around cleaning and tidying my flat until I achieved my version of perfection. The evenings were then spent attempting not to break this perfection, including watching TV sitting on the floor so I didn’t mess up the sofa, brushing my teeth in the toilet in order not to mess the sink, and a nightly battle of getting into bed and sleeping without messing the pillows and sheets – all the while knowing that every activity I did was completely mad. Ironically, when my OCD was at its worst, I would crave a period of depression. It’s a perverse concept, but depression was a break from OCD – an opportunity to sleep liberally, to stop brushing my teeth, to lounge on the sofa. I entered adulthood unsure of my place in the world and without an understanding of, or connection to, my authentic self. I came out as a gay man and was able to openly discuss my depression with my mum and doctors, and this began a life littered by periods of being mentally healthy (with OCD), followed periods of time off work on antidepressants. This battle with depression, anxiety and OCD I temporarily and regularly overcame with overspending, high-achievement and continuing to sacrifice my needs for others. Therefore, the mask I wore to the wider world was one of success, as defined by society. I maintained this version of my life throughout my twenties, but knew I had to do something to overcome it properly; I couldn’t allow myself to continue to be an actor in my own life. A short period of counselling supported me in gaining a deeper understanding of my challenges and how I arrived where I was, but it failed to give me the freedom I desired. I became a self-confessed, self-help junkie and I continue to be passionate about all areas of personal development. In 2012, at the age of 29, I decided to take responsibility for my life and my goal to be my authentic self – less who I was and more who I wanted to be. So, I found myself sitting in the NLP practitioner training course removing masks, letting go of limiting beliefs and addressing my negative emotions. Change didn’t happen in an instant; it’s a gradual process, which is difficult but not impossible. Since then, I have furthered my studies into human potential, achieving qualifications as NLP Master Coach Practitioner, Master Practitioner of Time Line Therapy, Master Practitioner of Hypnotherapy, and I am a Certified Learning and Development Specialist. My greatest achievement is overcoming my mental health challenges and committing to follow my dreams to live life on my own terms. In 2015, I decided to become a full-time life coach. I finally had my mental health under control, I hadn’t experienced a period of depression for a few years, and I had brought my black dog to heel on a couple of occasions. I’d overcome my OCD, although I am still a tidy person. I was ready to help others, and after 18 months as a full-time life coach, I had a huge realisation. Much to my surprise, I found a final mask. While I had overcome my depression and OCD using coaching and NLP therapy, I refused to proactively seek clients with mental health challenges. I was scared to offer life coaching as a valid mechanism to support a person’s mental healthcare. More than that, I wasn’t willing to share my story for the fear others would think less of me. I knew I was turning my back on people I had the most potential to help, and I knew this was the final hurdle I needed to jump in order to achieve my goal of truly being me and owning my past, present and future. That day is today. Readers, thank you for listening to my story, told with pride, this article is my final mask, removed and cast aside. Sometimes life seems unfair, like we’ve drawn the short straw. What Chris discovered though, is that if we choose to take responsibility, not for everything and everyone, but for ourselves and how we feel, we have the power to change things. Chris had a breakthrough with NLP. We all have the right to find the help that will truly allow us to be ourselves. He took that brave step and it paid off – helping not only himself, but now others too! 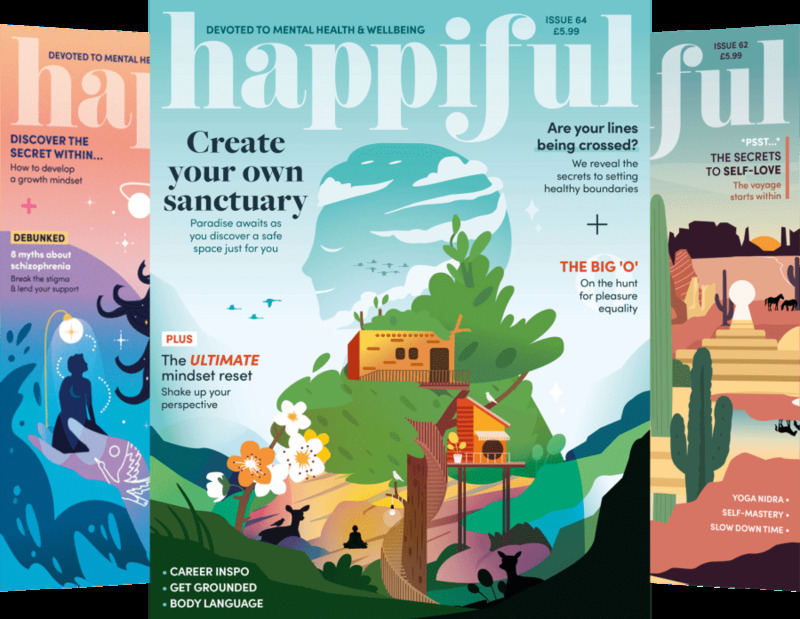 Chris is a contributor to the April issue of Happiful.